Today's single region Esmaraldas 60% cacao bar from Pacari Chocolate (Ecuador) was rich, but very smooth, with a very slight floral note at the beginning. I've featured several chocolates from Pacari this week. All have had a similar flavor profile -- not too harsh or acidic, smooth with a fairly rich chocolatey taste. I'm tempted to ascribe these flavors to Ecuadorian origins. However, I'll continue to look at other makers who are using beans from Ecuador, to see how these different makers ferment, roast, conch and temper (cacao from the same region) --resulting in a range of flavor differences. 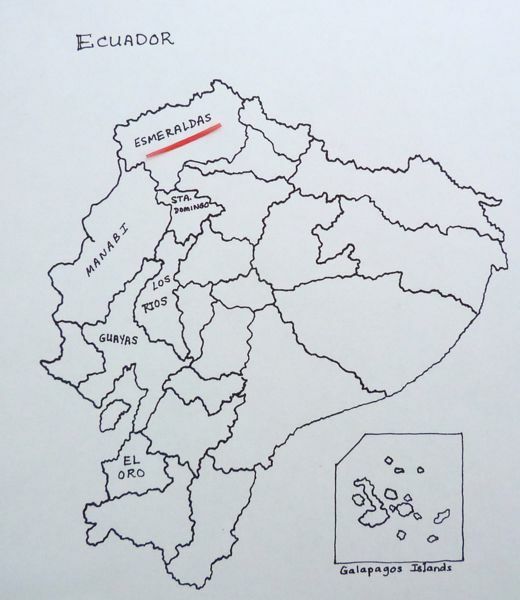 Pacari is a fairly large "tree-to-bar" chocolate company in Ecuador, that works with as many as 2,500 farm families, over approximately 3,000 hectares of land. Having a slightly larger bean base to work with, may make it easier to blend and balance flavor profiles than a smaller batch maker in the U.S. or elsewhere out of country. 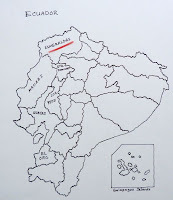 Today's single region bar was made with beans from Esmeraldas -- a province in northern Ecuador (see map), northwest of the capital city of Quito. In addition to supplying organic (and some raw) chocolate bars, the company's packaging mentions fair practices/efforts to support farmers, and to preserve biodiversity of the Arriba Nacional (general type of cacao) forest. Today was Day #8 of Chocolate and Ecuador Theme Week.